I made a post in the Asian Scouting thread, but thought I'd make a thread about Kakitani and update it with how he's getting on. Yoichiro Kakitani is a Japanese football player who currently plays for the J-League 2 side, Tokushima Vortis (Currently out on loan from Cerezo Osaka) In 2006, he signed his first professional contract with the Osaka club at 16. He was a member of the U-17 Japan national football team which successfully won the AFC U-17 Championship 2006, Kakitani was named Most Valuable Player in that tournament starting 4 games (1 sub) and scoring 4 goals. 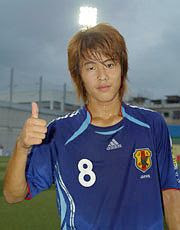 The following year, Kakitani scored twice in the 2007 FIFA U-17 World Cup held in South Korea. The best of which came against France where struck a spectacular shot from the halfway line and went in. Domestically, his scoring records are below par for a player of Kakitani standards. In 2007, he played 21 games, scoring only twice. In 2008, he played 24 games, but didn't net once. This season for Cerezo Osaka he played 6 games scoring twice. Kakitani has recently been loaned out to Vortis. My initial feeling was that with Kakitani moving to a perceived 'lesser' team that it'll help him improve, as he'll be one of their top players this season, so it'll put pressure on him and hopefully get him back on track and banging in the goals. In his debut for Vortis, Kakitani started and played all 90 minutes, and scored the opening goal against Yokohama FC on the 18th minute. Vortis won the match 2-0. In his next game, Kakitani again played the full 90 minutes, but could do little to help Vortis out as they were thrashed by FC Gifu 3-0. In his third match for Vortis, he played another 90 minutes and came up big in the 73rd minute as he scored the winning goal in a 2-1 victory over Ventforet Kofu. Vortis currently lay 5th in J-League 2 on 38 points, after playing 24 games. One point ahead of Tokyo Verdy, but a huge gap of 10 points behind fourth place Ventforet Kofu. Hopefully Kakitani will carry on playing well and will be a big part of Cerezo's campaign next season in J-League 1 (Cerezo are currently top on 52 points). Just wondering, how big a team are Osaka in the J-League? Are they as big as Gamba Osaka? Cerezo in my opinion are too big of a club to be in J-League 2, and will be promoted this season. They were within a minute of winning the J-League Championship back in 2005. All they had to do was to win, or if they drew have the other four clubs who were in with a chance not to better their result. But a last gasp equalizer by FC Tokyo ensured that the title was heading to their rivals Gamba who won 4-2 on the final day. But they are no where near on the same level as Gamba nowadays. Gamba are one of the dominant forces, not only in Japan but, Asia. But Cerezo has had a long history of producing great young players and the current squad will hopefully stay together for a long while so we can see the current crop of talent mature to their potential. Cerezo in my opinion are too big of a club to be in J-League 2' date=' and will be promoted this season. They were within a minute of winning the J-League Championship back in 2005. All they had to do was to win, or if they drew have the other four clubs who were in with a chance not to better their result. But a last gasp equalizer by FC Tokyo ensured that the title was heading to their rivals Gamba who won 4-2 on the final day. Thanks a lot! All I needed to know and more, Kakitani will probably move imo though. And I think to a big club. he has more of the qualities of an AM. Such pace and techniqe, plus a cracking shot! So i would prefer him in that role. hope he makes a move to a top Euro side in the next 3 years. Can really see him being the next Park Ji Sung... except better! Yoichiro Kakitani played the full 90 minutes yesterday in Vortis' 1-1 draw with Thespa Kusatsu. He didn't score but played well. His stats this season are now played 10, scored 4. Play another 90 minutes yesterday against Fagiano Okayama. Vortis won 1-0. Kakitani was the best player in the Vortis side that were thrashed 4-0 by Tokyo Verdy. Vortis were down to 10 men for nearly all the second half. Was Ali Elsamni playing in that match for Tokyo? I know he has been on trial at FC Astra Ploiesti but was hoping he played? Elsamni is still on trial with Astra I believe. He weren't playing during the match, so he's either still in Romania or jet lagged if he's been sent back from the trial. Kakitani was Vortis man of the match in their 2-0 home defeat against Mito Hollyhock. Vortis played better for most of the game but slipped up in the last 20 minutes, and payed for it on the 72nd minute. While they tried to press the game and win back possession they conceded a penalty with two minutes which Mito's man of the match Kikuoka converted. The loss has meant that Vortis remain in 8th place, 5 points ahead of 9th place Consadole Sapporo, and 4 points behind 5th and 6th placed Tokyo Verdy and Mito Hollyhock. How many games is that in total now the mate? According to SM, he doesnt have a club at all. Whats happend, did he get released? His game against Avispa Fukuoka brings his appearances up to 14 games this season (8 for Vortis, 6 for Cerezo). Vortis drew the match 1-1, they conceded a goal in the last minute. They should have won as they played the better of the two sides. His current club Tokushima Vortis aren't on the SM database which is why he's shown as not being at a club. His game against Avispa Fukuoka brings his appearances up to 14 games this season (8 for Vortis' date=' 6 for Cerezo). Vortis drew the match 1-1, they conceded a goal in the last minute. They should have won as they played the better of the two sides. So do you think he'll be looking at a rise next time round? It's a tough call to make on Kakitani, as I don't know whether SM only take into account the number of games and goals, or whether they look at performances. Kakitani is the kind of player that hasn't realised how good he can be, which is why he hasn't been scoring lots. Though he has assisted quite a few. I believe for him to get a rise in the next ratings change he needs to be put back on loan at the end of the season. As if he goes back to Cerezo, Kagawa and Inui will keep him out of the starting 11. Since coming to Vortis, he's picked up a nice partnership with Ishida and Haji. I believe if they have a full season together, Kakitani can have a break through season where he could rise to 80. He was instrumental in Vortis' 2-1 win over Shonan Bellmare, who were top of the league, on Sunday. Since the last time I posted Kakitani has played 3 more matches for Vortis, playing the 264 minutes altogether. He played a big part in Vortis 6-0 thrashing of Ehime FC on the 1st August. Although he didn't score he assisted with a few. He was also one of Vortis best players in the closely contested match with Kataller Toyama on the 5th. Vortis just losing out on that game 2-1. Kakitani finally broke his drought on the 10th, against Roasso Kumamoto. His goal on the 52nd minute sealed an impressive 3-0 victory. Kakitani played for 73 minutes in Vortis' 1-0 defeat to second place Vegalta Sendai on the 16th. Kakitani picked up a little niggle during the match which is why he was substituted. Haven't heard any reports to indicate that he wont be fit for Vortis' next match on the 23rd against 4th place Ventforet Kofu. Kakitani played 79 minutes in Vortis' 1-0 home defeat to fourth place Ventforet Kofu. Kakitani picked up a yellow card on the 66th minute in a closely contested match, which Vortis can feel they deserved something out of it. Kakitani next match is away against second bottom Yokohama FC on the 30th. Kakitani next match is against Tokyo Verdy on the 6th. Haven't been able to log into this forum for ages so haven't updated this thread for donkey years. To cut a long story short, Kakitani has played 32 games (6 for Cerezo) and scored 7 (3 for Cerezo) so far this season. Kakitani has been allowed to stay at Vortis for another season to give him more first team football. Since the new J-League 2 season has started he has played in 5 matches (279 minutes) scoring 2 goals. Vortis currently lay in joint third place, two points behind leaders Kashiwa Reysol, but have a game in hand on them. Kakitani played 85 minutes in Vortis' goalless draw with Ehime. Vortis are now 4 points behind the leaders Kashiwa Reysol, but have a game in hand. Kakitani next game is against 16th place Kataller Toyama on Sunday.